Once you’ve been granted planning permission the next step is to apply for Building Control Approval which means producing a set of drawings known as Building regulations drawings or Working drawings. Whether your new house was designed by a Package Provider such as ourselves, your own Architect or You, we suggest that the Building Control Drawings are carried out by your chosen Timber Frame Supplier. We say this because there are a myriad of technical details that differ between Timber Frame and the more widely understood brick and block systems. It’s not unusual for an Architect instructed by their client to produce Working Drawings to ring us many times requesting technical details. In those circumstances you’re paying them for additional hours, and there’s a danger of mistakes creeping in which can prove very costly once on site. You’ll probably be aware that a Building Inspector will visit your project at key stages to ensure that everything is being constructed as per the building control drawings mentioned in step 1. You may not be aware that you don’t have to use your local councils building control service. The industry has been deregulated and there are lots of independent companies offering building control services, often at a price below that of the local authority. As a Self Builder, unless you’re employing a main contractor to deliver your project to completion you’ll need a 10 year insurance backed structural warranty. The exceptions to this are if you’ve no intention of selling within 10 years of completion or don’t require bank finance. Many companies offer a combined Building Control and Structural Warranty package which means you’ll have just one inspector visiting site rather than two which can only be a good thing. The same companies can normally offer competitive site insurance to, so ask them for a quote. As soon as you’re sure there are no further changes to be made and you’ve signed off your building control drawings the Engineering and Timber Frame panel design commences. At Solo Timber Frame these processes are included within the cost of the Timber Frame itself and take place in the background, so you don’t need to concern yourself with this. However, within this drawing package is something called a Setting Out Plan. These drawings should be handed to your ground workers before they commence building the foundations and are usually available approximately two weeks after engineering starts. The setting out plan details the exact size of the foundations, tolerances required and where any excessive line and point loads are. If foundations are built prior to this the Timber Frame must be reverse engineered which adds unnecessary cost and complexity to your project. Today’s Building Regulations requirements are getting tougher and tougher and a seemingly endless stream of testing and paperwork is sometimes required in order to satisfy Planners and Building Control Officers. Some of the professional services you may require include SAP calculations, Bat surveys, Noise testing, Air pressure testing, Desktop land surveys, Paper to AutoCAD conversion, Soil testing, Tree reports and Archaeological watching briefs. You’ll be very unlucky if you need all of these, but put some money aside in your budget as you’ll likely need some. For £2,500 + VAT Solo Timber Frame will prepare working drawings suitable for submission to your Building Control and Warranty Provider. This service is not limited to planning drawings produced by Solo Timber Frame. 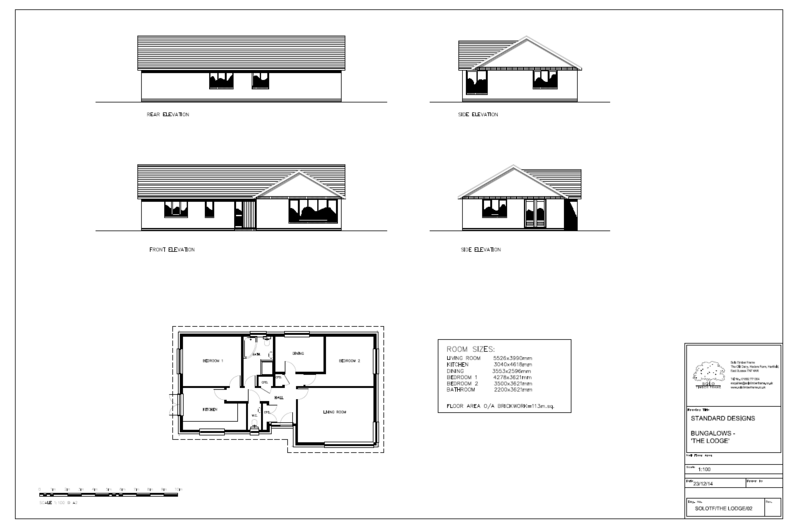 We can also work from your Architects planning drawings. We can help you choose the best providers of Building Control and Warranty services as some are more suited to Self Builders and others to Developers. When you order a Solo Timber Frame building, all Timber Frame Panel Design and Engineering is undertaken by us within the price of the frame, so you don’t need to get involved in this black art. We’ll also help you manage any other paperwork required.